Does any one out there in SH land have pictorial and/or dimensional difference in the 2 different style stock bars? Thanks mate. I'm looking for some a little lower and further forward. 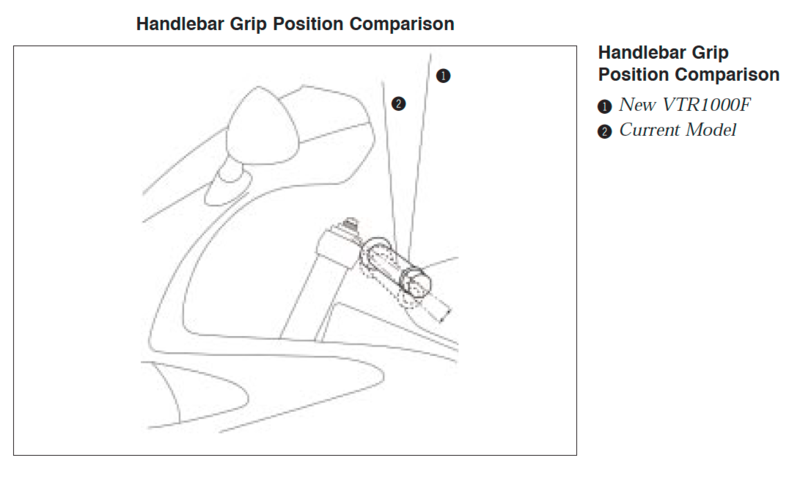 To provide a more relaxed riding position for increased handling freedom and more comfortable long-distance riding, the Firestorm’s clip-on style handlebars were raised by 15.6mm and angled upward approximately 7 degrees for a slightly more upright posture that lends itself better to long hours on the road. Wic, Thanks for the great fact sheet. I'm one of those weirdos that prefer low, forward mounted bars. I'll probably resort to adjustable clipons. I use apex riser bars. They adjust in every possible direction. You can change it whenever you want. I never knew there was such a thing as Gen1 and Gen2 VTR. After 20 years of riding one you would have think I would know that! Jamie, From what I gather the 1st vs 2nd gen changed when Honda changed the instrument cluster, fuel light to gauge, Etc. see picture above for physical difference in position. Last edited by E.Marquez; 09-17-2018 at 05:34 AM. Yes, there were quite a few minor tweaks made around 2000. I've never heard of them called "Gens", and I do not think that terminology is appropriate. For all intents and purposes the VTR's remained unchanged throughout their production years. My comment above was a little tonge-in-cheek. Rough shifting from 1st to 2nd!